You don't get a reputation like that by dressing like a clown. The Jedi were masters of looking both instantly recognizable in crowd, but also underwhelming at the same time, which resulted in them often being underestimated. If you were up to some shady business, and received a visit from a Jedi, would you expect a shaggy haired space monk in an old bathrobe to be any threat to your gang of heavily armed mercenaries? Probably not, but you'd be in for quite a surprise once the robe came off and the lightsaber came out! A Jedi's robe is such an important part of their look that if you're cosplaying as one of these heroic space wizards from the Star Wars saga, this Authentic Jedi Robe is as essential as a lightsaber! 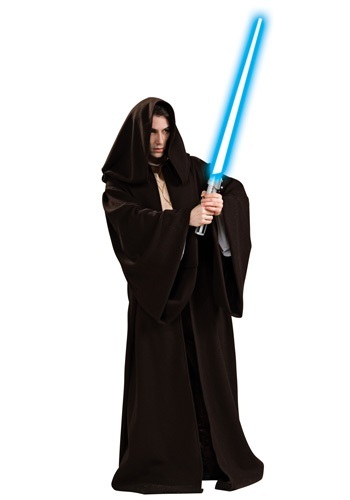 This officially licensed full length robe looks just like the garments worn in the films, and features a hood and wide drooping sleeves, to add an air of mystical mystery to your costume. Whether you're dressing as a master, padawan, or a renegade Force user, this robe will make your Jedi attire look as legit as the ones worn for a thousand generations!